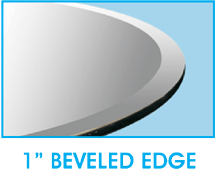 The 36”x 60” Racetrack Oval Glass top has a thickness of 1/2 inch. This clear glass table top is made from the finest quality furniture glass that has been tempered for added durability and safety. The racetrack oval top features a stylish 1” beveled edge and has a weight of 60 lbs. 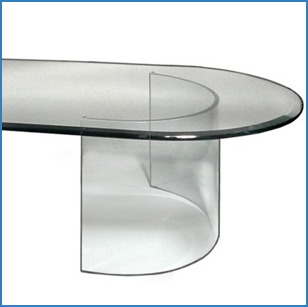 The glass table edge is carefully polished for a stunning look. Each beautiful racetrack oval glass top comes with free bumpons that are placed between the glass and the base to protect the table beneath. Each glass table top from Glass Tops Direct is professionally packed in an individual carton with styrofoam for unbeatable protection from breakage during shipment. The 36”x 60” racetrack oval glass top will be sent quickly via FedEx or common carrier and is insured to for a safe arrival.